Cherries aren’t cheap these days. 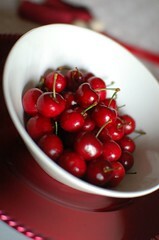 While they’re hardly a luxury item, good sweet in-season cherries are an infrequent, and rather indulgent treat. They’re the only reason I’ve been tempted to move to Traverse City, Michigan. I recently picked up about four pounds of these stemmed rubies and made off to do a little baking, and munching. After all, I had to justify my recent raid on the Broadway Pandhandler’s and Zabar’s stock of tart pans. I wanted to keep the preparation and presentation as simple as possible, so I decided to make a no-fuss French fruit tart – just pie dough, fruit and sugar. 2. Roll out your pie dough in a tart pan. I used the same sable crust as the Chocolate-Orange Ganache Tart. Dock the crust and sprinkle liberally with sugar. 3. 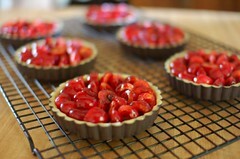 Mound the pitted cherries into the prepared tart pan (approximately 1 1/2 lbs. – 2 lbs. of pitted cherries for a 9″ tart pan) or, if you’ve halved the cherries like I did, and would like a more elegant pattern, line the cherry halves into the tart pan in a circular pattern, trying to cram as many cherry halves into the pan as possible while still maintaining an orderly pattern (they will shrink during baking). Sprinkle granulated sugar over the cherries. 4. Bake for 28-30 minutes, or until the cherries have released their liquids and the juices have become syrupy. 5. Remove the tart from the oven immediately and set to cool on a baking rack. ~ by ulterior epicure on June 1, 2007.